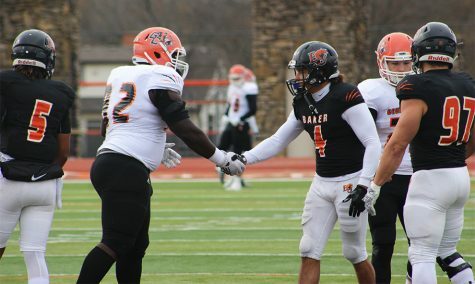 The Baker football season came to an end Saturday when the Wildcats were defeated by Southern Oregon University 24-19 at Liston Stadium in the second round of the NAIA playoffs. Although the Wildcats fell short of winning, head coach Mike Grossner was proud of their effort. 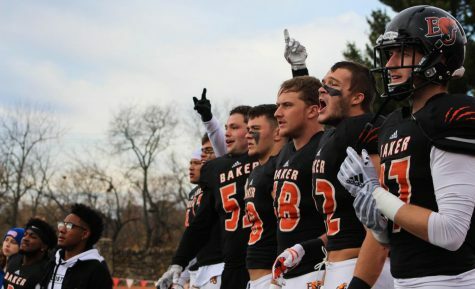 Any hopes for a Baker comeback ended on a questionable pass interference call with under two minutes remaining when Southern Oregon’s pass attempt toward the Baker end zone fell short, but a collision resulted in a penalty. “You better be all over somebody to call a penalty like that in that point of the game, and that’s my only comment on that,” Grossner said. 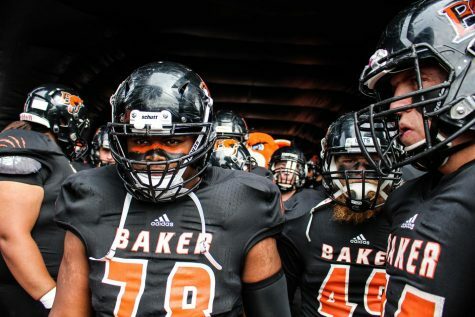 The Wildcats were held to 342 yards of offense, while the Raiders tallied 451, a season-high for any Baker opponent. 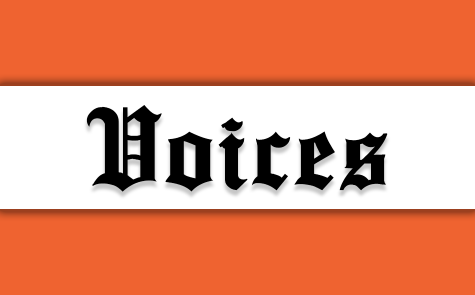 Southern Oregon’s biggest play came on the first drive of the second half, when Tanner Trosin escaped multiple defenders and unleashed a pass that Matt Retzlaff caught and ran for a 60-yard touchdown. Southern Oregon started the game with the offense pinned at its own 1-yard line, then the Raiders marched down the field 99 yards for a touchdown. The Raiders took a 7-0 lead into the second quarter before BU sophomore kicker Abram Garcia hit a 36-yard field goal to bring the game to 7-3. Southern Oregon responded on the ensuing possession, going 58 yards into the end zone, capped off by a 19-yard Melvin Mason touchdown run. Mason put two scores on the board for the Raiders, the first coming on the Raiders’ 99-yard drive in the first quarter with a 1-yard run. He finished the game with 89 yards on 16 carries. 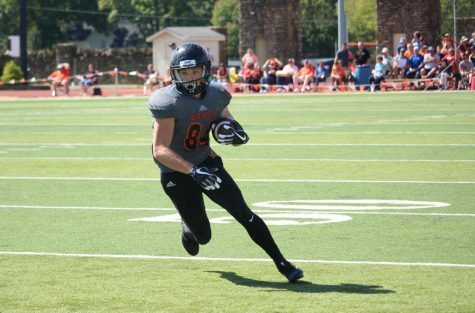 On the kickoff following the Southern Oregon touchdown, Damon Nolan returned the ball 76 yards all the way to the Raiders’ 14 yard-line. The offense lost a yard on the first two downs, but sophomore Logan Brettell hit junior Quanzee Johnson for a 15-yard touchdown on third down to cut the Raider lead to 14-10. Southern Oregon had a chance to extend the lead at halftime, but senior Tucker Pauley picked a pass off in the end zone to keep the Wildcats’ halftime deficit at four points. 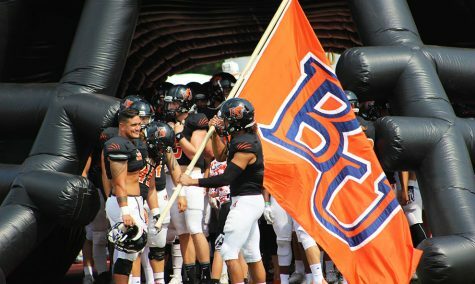 After the long touchdown pass by Southern Oregon early in the third quarter, the rest of the third quarter was highlighted by a 28-yard Garcia field goal that brought the score to 21-13. The Raiders started the fourth quarter with the ball and drove all the way to the Baker 1-yard line but settled for a field goal to put Southern Oregon up 24-13 with a little over 10 minutes left in the game. “I thought the key was that they were able to control the ball in the second half, really right as we were getting things going on offense,” Grossner said. 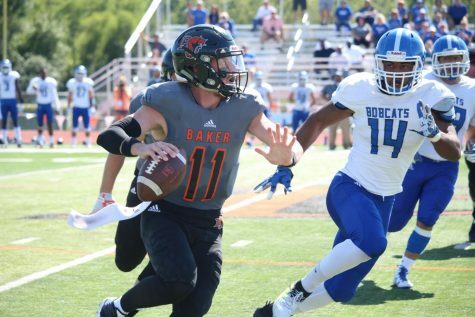 After averaging 408.5 yards passing per game his first two games, Brettell was held to 206 yards against Southern Oregon. He also added 47 yards on the ground, including a 7-yard touchdown run to bring the Wildcats to within one score with 2:55 remaining in the game. 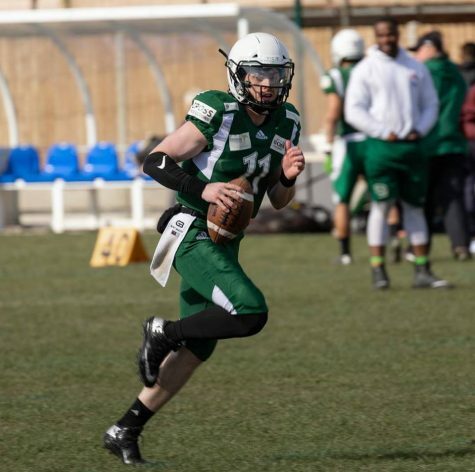 The offense then attempted a two-point conversion that would have let the Wildcats tie with a field goal, but an Alex Stebbins run fell short of the goal line and kept the Raider lead at 24-19. “If we got those two points there, we wouldn’t have to onside there and we could kick it deep, pin them back and do our thing,” Grossner said. Grossner thought this team had the potential to be national champions. “If I thought we weren’t better than the team we played today, I wouldn’t be as upset, but I think a national title team lost today,” Grossner said. 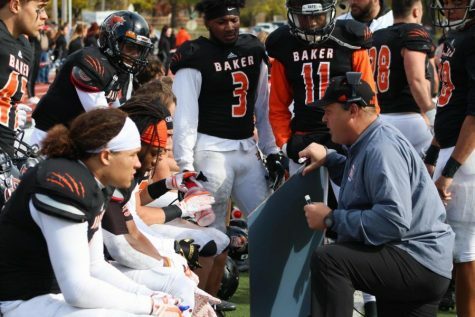 The Wildcats finished the season with an 11-2 record, tying the 2013 Baker team that also lost in the second round of the NAIA Playoffs.